McLaren Automotive is today celebrating the beginning of full production of the new 720S supercar, with the completion of the ‘Job#1’ car. Finished in Glacier White, the car is ready to leave the McLaren Production Centre in Woking, Surrey, England, having been hand-assembled by McLaren’s craftsmen and craftswomen. 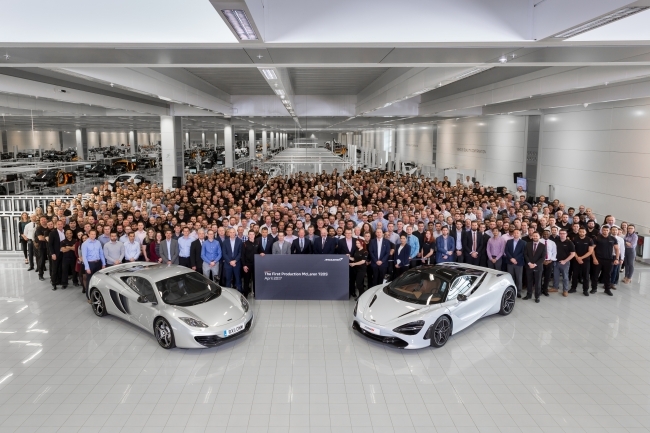 The move to full production marks the beginning of a new chapter in the McLaren Automotive story, as the second generation of the Super Series – codenamed ‘P14’ – replaces the first generation, ‘P11’ model family that encompassed the original McLaren 12C and subsequent derivatives, as well as the McLaren 650S and 675LT. 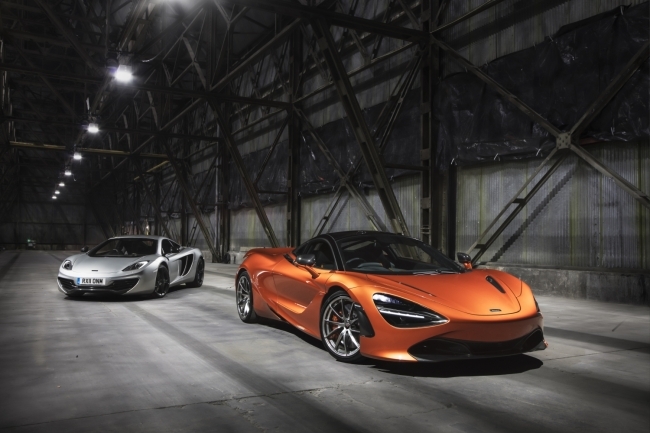 The first of 15 new McLaren models confirmed for introduction by the end of 2022 under the company’s Track22 business plan, the new 720S personifies the blend of extreme performance, crafted luxury and unparalleled driver involvement for which the brand is renowned. Lighter, faster and even more dynamically capable than the McLaren 650S it replaces, the new 720S is powered by a 4.0-litre V8 twin-turbocharged engine that produces 720 horsepower. The result in performance terms is astonishing, with acceleration from 0-60mph achieved in just 2.8 seconds and 0-124mph (200km/h) taking 7.8 seconds. The maximum speed of McLaren’s new supercar is 212mph (341km/h) and comes with a price tag starting at £208,600. The first-generation Super Series introduced McLaren Automotive to the supercar world and in total more than 7,000 have been sold. The story of the model line carrying the internal McLaren designation of ‘P11’, began in 2009 when the 12C was first unveiled and subsequently launched in 2011 by the recently formed company. With a carbon fibre, composite MonoCell chassis and twin-turbocharged, mid-mounted V8 engine, the first new McLaren model for almost two decades instantly presented an alternative for serious supercar buyers. Just one year later, the 12C Spider was unveiled in the United States at Pebble Beach. Featuring a retractable folding hardtop roof that could be raised or lowered in less than 17 seconds, the Spider was built around the same MonoCell chassis as the Coupé. With class-leading handling, rigidity and safety, the 12C Spider notably did not require any of the extra strengthening usually required for an open-roof car, thanks to McLaren’s carbon fibre chassis technology. It wasn’t only on the road where the 12C excelled. The 12C GT3, which featured a host of aerodynamic upgrades and weight-saving measures, was designed to compete in the FIA GT3 category and proved successful from the start, scoring its first race win at Circuito de Navarra in Spain in May 2012. From the 12C programme emerged the GT Can-Am Edition, the first of the new generation of road-going McLarens designed to be the ultimate ‘track-day’ car. The P11 family enjoyed significant growth in 2014, with the launch of the 650S and 650S Spider at that year’s Geneva International Motor Show. Joining the existing 12C in the Super Series range, the 650S incorporated design and engineering features inspired by the flagship McLaren P1™. Offering the best power-to-weight ratio in its class, with performance and efficiency both increased, both Coupé and Spider 650S models nevertheless retained exemplary ride comfort and refinement. Following the 12C GT3’s on-track success, it seemed only natural for the 650S to receive the same motorsport treatment: revealed at the 2014 Goodwood Festival of Speed, the 650S GT3 featured improved aerodynamics as well as enhanced refinement and driver comfort. Making its competitive debut in 2015, the car proved even more effective than its predecessor, winning both the Bathurst 12 Hour (scoring a pole position and setting a new outright lap record along the way) and the Blancpain Endurance Series in 2016. A lightweight, track-focused addition to the range was debuted at the 2015 Geneva Motor Show. Named 675LT in tribute to the famous ‘Longtail’ F1 GTR racers of the late 1990s, the car stayed true to its iconic namesake, becoming the lightest, most powerful and fastest Super Series model. Weighing 100kg less than the 650S, wearing ‘sticky’ Pirelli P Zero™ Trofeo R tyres and featuring a stripped out – yet still comfortable – interior, the 675LT offered the most focused driving experience of any road-going P11 Super Series car. In response to customer demand, less than a year later at the end of 2015 an open-top version of the 675LT was announced. With production once again limited (the full series of cars was sold in the space of just two weeks), the 675LT Spider featured the same weight saving, optimised aerodynamics, increased power and suspension geometry as the coupé, making it the most extreme open-top McLaren ever built. The 675 LT models were built alongside the 650S Coupé and Spider and with production of the latter ending in 2016, it was one of these iconic cars that brought the first-generation Super Series to an end.